The characteristics of this palm is extremely different than the European form having narrower and more deeply divided leaflets, the entire leaf being covered with a waxy coating creating a very blue appearance. Contrast of color and texture is a key to an attractive landscape. The shades of Blue may vary depending on how much sun the individual specimen receives, but will definitely be noticed as something different and unique. 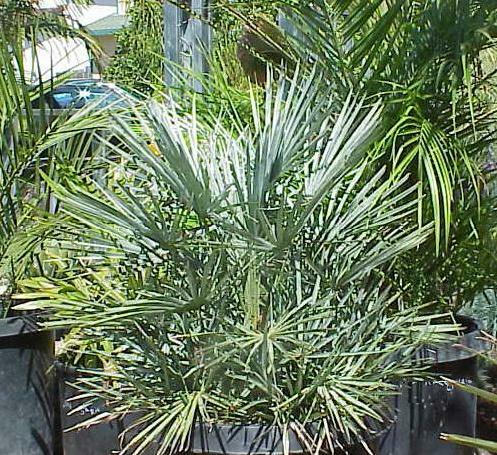 This is an easy to grow palm, but the availability is limited. If you can find one at a Palm Nursery, you should not pass opportunity to aquire for your garden. The spread of this variety is not certain since it is so new in cultivation, but it is believed that it could be up to 20' like the Northern European Chamaerops humilis. Vertical growth rate is accelerated when suckers are removed. Native habitat is the Atlas Mountains of Morocco and it is equally as cold hardy as it's European relative.